Alan Knowles from Cura Financial Services looks at quality over quantity when it comes to critical illness cover. At the time of Dr Barnard’s vision for Dread Disease Cover, conditions such as cancer and heart attacks were truly life changing conditions, with survival rates much lower than what we see today. Critical Illness Cover started off as quite a simple policy, if you had cancer, a heart attack, a stroke or you needed coronary artery by-pass surgery, you were generally covered. That was 35 years ago, now, you don’t just get cancer, heart attack and strokes. You also get carcinoma in situs, silent heart attacks, mini-strokes and a variety of other ‘lesser’ conditions. Medical advancements mean that we can now identify more conditions, treat them more effectively, and ensure they do not have such a devastating effect on our lives. Cancer, heart attack and strokes are no longer likely death sentences. Critical Illness Cover has evolved alongside medical developments. We saw an example of this earlier this year when the ABI added an exclusion for early stage papillary thyroid cancer and removed HIV, from the model critical illness wordings. Over the years as other debilitating conditions were identified, insurers began a conditions race of one-upmanship, of who could cover the most illnesses. Sounds fantastic, but the problem is that some of the conditions added were so infinitesimally different that they are hardly worth naming separately, or are defined in such a way they are unlikely to ever be claimed on. The good news is that we seem to have now reached a turning point where more practical and useful changes are being made to these policies. The message is being heard that numbers aren’t everything. Quality is better than quantity. Last year Scottish Widows went against the norm, by removing conditions and focusing upon improving definitions for successful claims. As a father of three young boys, I personally love the fact that Royal London, Aviva and Legal & General allow you to enhance your children’s cover. I think the new Guardian proposition is a real shake up, with their commitment to offer future critical illness improvements to existing clients, feeling like a breath of fresh air! All this being said, I believe that two of the key factors affecting critical illness cover is, that it is complicated and often distrusted. We no longer have just four conditions to understand, we often have over 50. And, how can we expect clients to understand these in full when the claims criteria still talk about ‘troponin levels’ and ‘histological confirmation and characterised by the uncontrolled growth of malignant cells’. Will Joe Bloggs believe that Critical Illness Cover will pay out, if his neighbour had a claim turned down because their cancer wasn’t severe enough. A big issue that we have is that potential claimants still slip through the net. Is it fair that a client diagnosed with Multiple Sclerosis gets a full pay out, but clients suffering a similarly debilitating condition who are bounced between specialists for years awaiting a diagnosis, get nothing? Maybe Total Permanent Disability (TPD) would cover some, but the benefit is often mis-sold or excluded from cover. So, should we consider ways to rejuvenate and simplify the cover? To rejuvenate the policy and provide an alternative to the conditions race, I would like to see a radical overhaul to Total Permanent Disability. A true ‘sweep up’ definition. One that picks up clients with all the symptoms and impacts of a claimable condition but are awaiting diagnosis, and those who have low incidence, high impact conditions which aren’t listed. If this is too much of a jump, then we could look at a partial payment, while somebody is awaiting diagnosis and they meet a certain criteria (less strict than the current TPD rules). 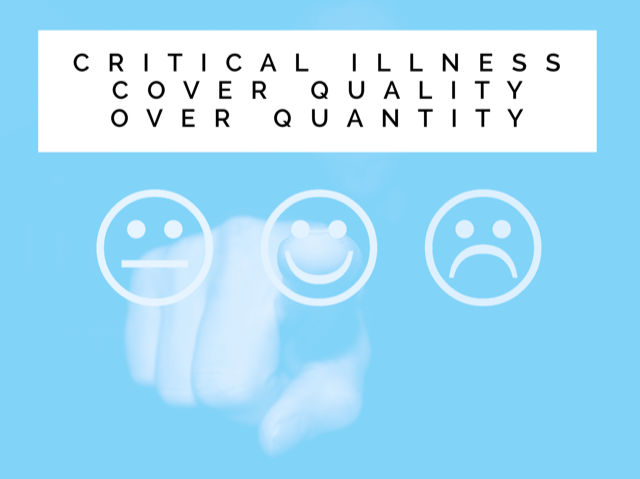 Whilst it probably reads like I am bashing Critical Illness Cover, I’m not, I do think the cover is in a good place and insurers are doing many great things (such as claim stats, annual statements and support services). My concern is how complicated it has become, which is only going to get worse with the increase of multi-option policies we are seeing. How are clients expected to fully understand every single condition and claim definition on the policy. Imagine when we reach an average of 100 conditions! More importantly, when a client comes to us scared because they have been diagnosed with a life changing serious illness, and relieved that they are going to receive money to help them recuperate, is it fair that we tell them “Sorry, but its not on the list”. Of course this is only my opinion, I’m sure everyone has their own thoughts. But I do believe we should strive to make it easier for consumers to understand and ensure insurance does what Dr Barnard intended, ‘give you money when you need it most’. Alan Knowles is Managing Director of Cura Financial Services, a multi award winning firm who specialise in providing Life Insurance, Critical Illness and Income Protection for customers with risk factors such as pre-existing medical conditions. Cura’s website can be found at www.specialrisksbureau.co.uk.